The room grows tense as the biscuits disappear into the tea. The only voice is that of the Tiffin Master, counting down the five long seconds. The dunkers withdraw their biscuits, and then settle themselves into comfortable positions. The elegantly attired lady, replete with miniature top hat, focuses her gaze on her soaking biscuit rather than her waist-coated and be-goggled competitor. The dunkers continue to stare resolutely at their soaking biscuits, watching for signs of a wobble. They need to be the last person to consume (“nom”) their biscuit to win, but only if none of their biscuit collapses onto their hand or anywhere else. The balance between waiting long enough to outlast the competitor and still performing a “clean nom” engrosses the entire hall of onlookers. The gentleman suddenly moves, consuming his biscuit cleanly, and the lady follows suit. We applaud loudly for the tiny top hat and her victory. 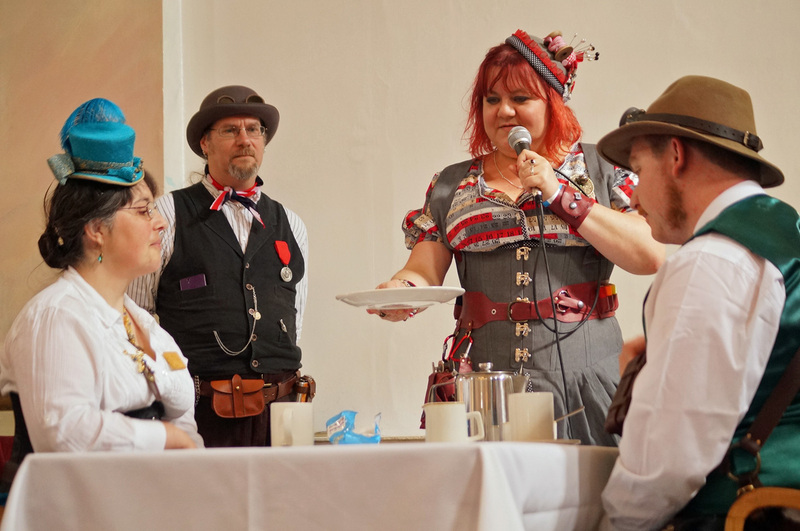 Tea Duelling was just one of the splendid events held at Lincoln’s Weekend at the Asylum VI, Europe’s longest running and largest Steampunk event. As a postgraduate researcher of neo-Victorian fiction, I’d managed to convince my Australian university to give me extra funding to attend this speculative neo-Victorian event whilst I was already in the UK for the British Association for Victorian Studies conference. They say that immersing yourself in a culture is the best way to learn a language, and there is no doubt that Weekend at the Asylum is immersive. In its sixth year now, the entire historic Bailgate quarter of Lincoln is transformed by the markets, events and the more than 2000 costumed attendees. One of the earliest events of the weekend was the enthralling Steampunk Western Shoot-Out, between competitors wielding painted and upgraded nerf guns. The unholstered category winner was a young lad, whose small stature assisted in his missing being the accurate target of the hilariously inaccurate weaponry. The holstered category was won by a gentleman who pulled himself out of his wheelchair, made his way to his corner with the help of his cane, and then proceeded to annihilate his opponents with his superb accuracy. He even claimed victor in the three way shoot-out, to the triumphant cry of the woman standing beside me: That’s my husband! This was followed by the first round of Tea Duelling. I refreshed myself appropriately, with tea, although later in the day the refreshments were provided by Hendrick’s Gin. They generously offered free G&Ts for entertaining the garden of other attendees, so my ability to recite Wordsworth and Shakespeare was put to good use. It was then back to the Ballroom for the excellent Costume Competition. 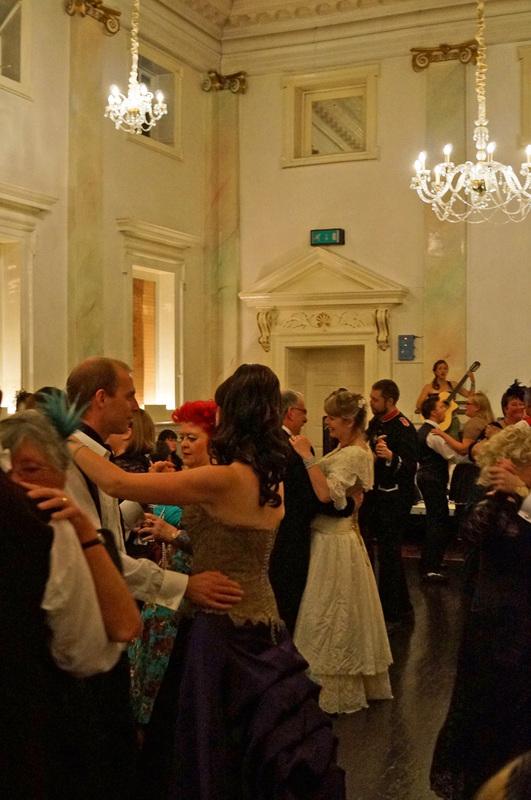 That evening was the Empire Ball. The event had sold out months earlier, but as always there were last minute tickets for sale, and I managed to snaffle one up. The next day was the Tea Duelling Championships, and the Wacky Races, including jetpack and cycle races. The highlight was the sportsmanship of the cycling competitors, who raced up the drive to the Castle, circled the court… and continued circling until the young boy being pushed had caught up and was on his way back. The adult competitors gaily fought it out for second place, to the cheering of the crowd. At a small panel discussing international Steampunk, earlier in the weekend, we’d discussed the inclusivity of the genre. There are almost no rules to Steampunk, especially in comparison with The Society for Creative Anachronism (aka Medieval Re-enactment), and very few ways of “winning.” By far and large, Steampunk is about participation. So in that spirit, perhaps I will bring Tea Duelling back to Australia! EDIT: The first Van Demonian Tea Duel has indeed now been held! A few months after visiting Lincoln I decided that my quarter century celebrations needed a good Tea Duel, and gathered some well-dress gentlefolk to join me. Tea Duelling has been on the Australian mainland for at least a year. A wonderful report of the weekend from Steampunk Journal. Bonus points for spotting me! A pictorial guide to Tea Duelling. Some great photos of the weekend from The Guardian. And my own full resolution photos, on Flickr. Speculative Fiction is definitely finding its way into academia, with the Steampunk Scholar leading the charge beautifully. Well met in the queue for the Ball (Me white tunic, red sash, Trews and a Fez). We are glad that you managed to purchase admittance and hope you enjoyed yourself enormously. Plug your Uni for next year in advance for aslum VII. We are always delighted to welcome new guests to the festival. We are very glad that you enjoyed it. We are currently looking at a five year strategic plan for the event and working with a committee of stake holders within the historic city. We would very much like to be able to host a small academic conference on both steampunk and neo Victorianism and would welcome advice, help and support towards this end. We hope you manage to get back again next year. 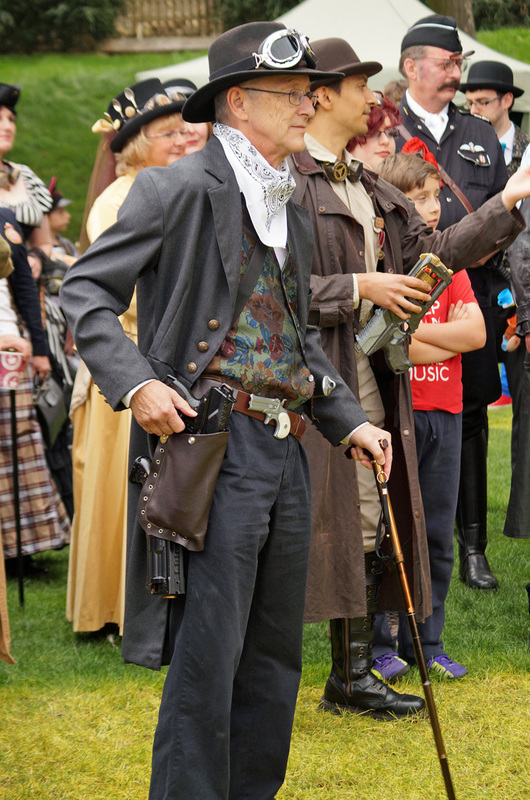 John Naylor (aka Tinker) Chair of the Victorian Steampunk Society and director of the Asylum steampunk festival in Lincoln. Major Tinker, that sounds like a marvellous plan! I would also be interested in bridging that gap between Steampunk as experience/reader and Steampunk in academia. Do keep me informed of any developments in this area, and I will offer any advice and ideas that come to me. I too hope that I manage to get myself back to the UK next year, although I doubt that the university’s funding stretches so far!